For much of her life, Gizelle Rocha has been in love with music. Whether the genre is jazz, blues, Celtic, or classical, she’s always eager to share her talent on the violin. Gizelle, who has autism, originally came to Douglas for the Career and Employment Preparation Program, and has gone on to become a music student at the College. She plays in the college jazz band and a local symphony orchestra. What is your main area of focus as a musician? My main focus is the violin. I have been playing for more than 12 years, since grade 5, and I never stopped taking lessons. I love it too much to abandon it. Why did you pick the music program? This program gives me not only the experience, but also the opportunity to perform in large ensemble, which I’ve never done before. Also, I can gain more knowledge and extend my skills as a musician who likes stringed instruments. Good friends who would treat each other like family and great teachers. Good Classical and Jazz music, as always. But more importantly, the love and support from every musical student who are accepted for their extraordinary gifts. What have you gained in the program? I have learned about teamwork from performing in two different ensembles, improving my ear training skills and singing, and also how to become your instrument. After learning the technicalities, you can learn how to express through your instrument. 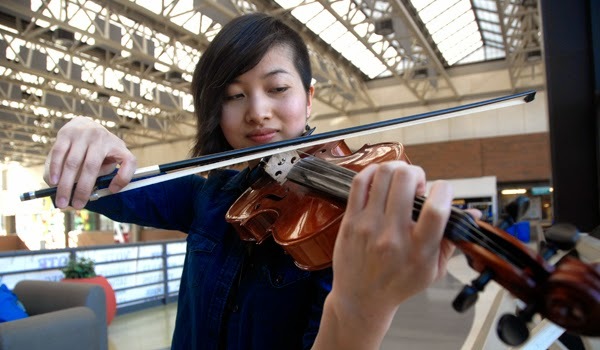 To learn more about music studies, visit the Douglas College website.